It’s a new year and the old ways of finding that next great job are so 2018. And let’s be honest, modern job searches are turbulent rides full of twists and turns with no magic pill that guarantees hiring success. Also, whether you love your job or hate it, it most assuredly is stamped with an expiration date. So with unemployment at historic lows and the Bureau of Labor Statistics showing the average employee tenure steady at 4.2 years since 2016, how do you successfully land your next role? Fear not, VALiNTRY is here to help with 4 job strategies for 2019 that will help you be prepared, stand out, and get hired faster. With the convergence of social networking, remote work, and increased competition for fewer available roles, a strong personal network will be one of the top drivers for the most sought-after roles in 2019. The best networks never exist by accident. What is a Network in 2019? A quality network takes effort and must be mutually beneficial for both parties. But before you start trying to grow and cultivate your network, it is vital to figure out exactly what you are looking for in both a job and a connection. Next, create a list of the people you know with industry knowledge or are connected with someone in the industry or the company you’re interested in and reach out to them first. You can further expand that list by finding recruiters and headhunters that work in your target industries and treat them as you would any other member of your network. Many people make the mistake of only talking to contacts when they need them but the most successful networkers regularly and actively engage the contact about their needs as well. This creates a strong bond that makes them more willing to support your job search efforts with suggestions, references and insight. How does that work? Schedule phone time, invite them to lunches, and ask for brief meet ups to stay up to date on what’s new in their workplace while sharing what’s going on in your current company. This will allow them to see how you could help their company grow and it gives you the opportunity request introductions to others they know. You should also learn who they are personally and what common interests you share. For example, if you and a reference are both sports fans, invite them to your Super Bowl party or offer them the extra ticket you snagged for the game this weekend. Trying to break into a new industry or prefer to make the initial connection face to face? Industry conferences, conventions, and events are also great ways to help you reach beyond your personal network to identify and connect with lots of professionals from a particular industry all in one place. You can find many event listings by joining industry groups on LinkedIn or simply googling your industry and conventions. Pro Tip: If you are unemployed or don’t want to use your current business card in your job search, create a personal business card that you can provide new contacts from a service like Vistaprint or Moo. Be sure to include your name, email, cell number your website / blog (if you have one) and your LinkedIn profile. Also consider listing a couple of key professional points about yourself that will help people remember you. Don’t just connect with people either. Find the companies you want to work for and actively engage with them on social media. Liking and sharing their posts as well as connecting with current employees both on and offline will make you much more of a known quantity when you apply for the job. Over the last few years, the application process has become lengthier and more complicated. Many companies now incorporate behavioral assessments while Applicant Tracking Systems (ATS) and video chat interviews are now the norm instead of the exception. Some HR departments and recruiters, like VALiNTRY, are even leveraging artificial intelligence to find the best candidates or using facial recognition to analyze a job seeker’s body language. If you haven’t been in “the game” for a while these might be intimidating developments but, if you’re prepared, they are nothing to worry about. AI is still in its infancy when it comes to job searches but VALiNTRY uses it to help us expand and grow our exclusive database of over 3 million qualified candidates that helps us find the best group of candidates for a particular role usually within 48 hours. We recommend that when you apply for a job, you first use a service like Jobscan to review your resume and determine if the major Applicant Tracking Systems and AI tools will see your skills for what they are. A well-crafted resume with impressive experience is no longer enough to help you stand out in a crowd. Hiring managers and recruiters want to see samples and results from your previous work and having that readily available via digital platforms like social networks or a personal webpage helps you put your money where your mouth is. This also gives you a chance to let your personality shine through and gives the hiring manager or recruiter an indication of how you might fit into the workplace culture. So, tell your story in an authentic but professional way that demonstrates what you’ve learned and accomplished over the course of your career. Pro Tip: If you don’t have a personal site yet, register a professional URL (e.g. your first and last name) to create a domain that’s uniquely you and don’t forget to include that link in your resume, email signature and networking cards! Hiring Millennials has made text messaging increasingly popular with recruiters. It’s a way to quickly touch base without your message getting lost in someone’s inbox or trying to find a convenient time to chat live. You should always be ready to respond quickly to requests for assessments, interviews, applications, etc. via text. And remember that, even though this is texting, always respond in a professional manner and NEVER send text messages without first proofing for spelling, grammar or other errors! Everyone looks at pay rates and insurance coverages, but the smart job seeker in 2019 also looks at the intangibles. They don’t view a new role as a transaction or an inconvenience. They see a job as an integral aspect of their lives that helps them infuse what matters most to them into their careers. Cultural fit is increasingly as important as traditional standards such as compensation and work/life balance. Remember this job will be a place where you spend a majority of your waking hours so if you are an extrovert who likes lots of personal interaction, you might want to reconsider a role where the entire team consists of introverts who despise even speaking to other humans. Being able to integrate with your new team will be crucial to your success so conduct research on sites like Glassdoor, ask your network and certainly grill the hiring manager / recruiter about what personality will best fit the role. Another way to stand out and get the job is if you understand a company’s values and you can clearly demonstrate that you share them. You’ll also fit better into the organization and stay longer if you have this common foundation. These days, it’s not hard to discover a company’s values online and it’s getting easier to find out if they actually live them through social media, news sites and other sources. Pro Tip: Need help discerning a company’s values? Start with the firm’s website, specifically the “About Us” and “News” pages, then dig into their Glassdoor reviews. This should give you a sense of what they value and how they express their values and will give you the ability to share how your values intersect during the interview process. Resumes customized for each new opportunity are hardly new, but you’d be surprised at how many job seekers still rely on the one-size-fit-all approach. If you want to beat the competition and land that job, you’ve got to handcraft each resume to ensure the recruiter / hiring manager (and many times the ATS) can tell you are a great candidate. Regardless of whether you customize or not, having a resume that doesn’t show measurable results won’t impress anyone. If you want the hiring manager to take you seriously, quantify your accomplishments instead of leaving them subjective. Hard data will make you stand out and helps the reader to see the value you’ll bring to the role. If you’re one of the millions of Americans who are uncomfortable negotiating for things like salaries, benefits or raises, it’s ok. You can learn the skill easily and it will be necessary in this hypercompetitive market. Once you have the skills, you’ll be able to get what you want from your new role instead of just taking the initial offer. Pro Tip: Not sure how to get improve your resume or get better at negotiating? Look to websites like Skillshare, books like Never Split the Difference: Negotiating as If Your Life Depended on It by Chris Voss, and even your VALiNTRY recruiter for help. Yes, the job market is tight right now and if you’ve been out of it for a while it can be a very intimidating place. With these strategies and the headhunters at VALiNTRY by your side, you’ll have a leg up on the competition to find the right job, interview and negotiate well, and create a long-term relationship with your new employer. Ready to get started? Submit your resume today and one of our recruiters will reach out to you ASAP. 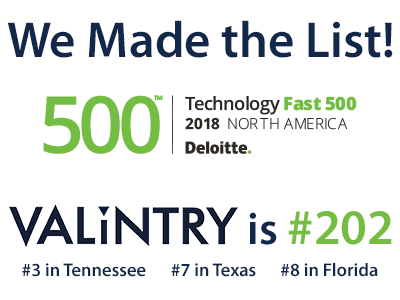 VALiNTRY Services today announced it ranked number 202 on Deloitte’s Technology Fast 500™, a ranking of the 500 fastest growing technology, media, telecommunications, life sciences and energy tech companies in North America. VALiNTRY grew 478 percent during this period. Deloitte’s Technology Fast 500 provides a ranking of the fastest growingtechnology, media, telecommunications, life sciences and energy tech companies — both public and private — in North America. Technology Fast 500 award winners are selected based on percentage fiscal year revenue growth from 2014 to 2017.